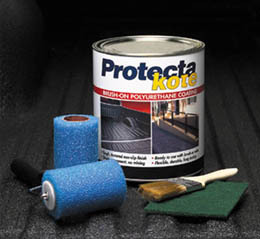 Protecta-kote is sold in 4 litre cans and in a ready-to-use kit which contains all the accessories needed to coat 5 - 8 square metres with the recommended 2 coats, or the load-bed of one small pick-up truck or delivery vehicle. Caution: This product contains flammable solvents. It bonds to skin, clothing etc. and is very difficult to remove once cured. Use this product in a well-ventilated area and avoid breathing solvent vapours. Wear rubber gloves and protective clothing. PROTECTA-KOTE must be protected from moisture. Whenever possible keep lid tightly closed. Use xylene to clean rollers and brushes. Acetone can be used for cleaning but not for dilution. Do not use methylated spirits, lacquer thinners, white spirits or other solvents. They will permanently prevent PROTECTA-KOTE from curing. 1. Stir Protecta-Kote very well before use, keeping the rubber crumbs in suspension. Use a mixer drill attachment if available otherwise use a stirring rod. Stir for at least 3 minutes just before beginning the application and stir occasionally during the application. 2. Remove vehicle tailgate if it is likely to be an obstruction. 3. Clean heavy dirt and grime from the truck bed or other surface using Xylene or Acetone. Alternatively water with an alkaline (only) domestic detergent may be used. 4. Allow the surface to dry completely. 5. All painted surfaces where PROTECTA-KOTE is to be applied should be roughened with a scouring pad or medium grit sandpaper leaving no glossy areas. 8. Old paintwork requires special attention: Loose paint must be completely removed, Rust must be removed to bare metal and primed before application of PROTECTA-KOTE, Clean and roughen remaining paint as per new paint (above). 9. Use masking tape and paper sheets to cover any areas which you wish not to be coated including latch bolts and drain holes. Ensure that you have clean-up solvents and rags in easy reach. Immediately remove PROTECTA-KOTE spills, drips and spots made while painting with xylene. 10. Stir Protecta-kote very well (For best results use an electric drill with a stirring attachment). 11. Protectakote may be thinned with up to 10% Xylene if it thickens after opening. Do not use any other solvents. 12. Using a paintbrush, paint corners, seams and difficult areas first. Dab PROTECTA-KOTE on rather than painting it on like paint. 13. Begin applying the first coat of Protecta-kote using the foam roller provided. For best results apply the first coat in one direction and complete each coat without break. Do not apply too thickly as "mud-cracking" will appear. Try to avoid the allowing the Protecta-kote to clump or run. Clean up any spills immediately. 14. Between coats, keep brush and roller moistened with xylene and protect for later use or discard and use a new one. 15. Stir the Protecta-kote again before starting the second coat. 16. Apply the second coat as soon as the first coat is tack free (2-6 hrs depending on conditions). Apply at 90° (perpendicular) to the first coat for a more even finish. Poor inter-coat adhesion will result when the second coat is applied after the first coat has fully cured. If the first coat has fully cured the surface must be abraded with 180 grit sand paper before applying the second coat. 17. Remove masking tape as soon as the second coat has been applied using a Stanley blade to prevent tearing. 18. The vehicle will be ready for light use in 6 - 9 hours. Full cure will take 48 hours so avoid placing heavy articles onto the painted surface for this period. If in any doubt please test the adhesion of PROTECTA-KOTE by applying a test patch. Rust must be removed down to the bare metal. Steel should be roughened, cleaned and primed with Protectakote Primer. It is essential that galvanized steel is cleaned and abraded until it is 'water-break free'. In this state, when wet, water will form a thin film that will not retract at the edges or break or bead at all, even on vertical standing. Cleaning can be done with a scouring pad and an alkaline (only) domestic detergent. Certain 'Galv Cleaners' are also effective at producing a 'water break free' surface. Unweathered fibreglass and gel-coats must be free of oils, waxes, polishes etc. then sanded to remove all gloss. Prime unweathered fibreglass with Protectakote Primer. Wood should be free from oils, waxes and polishes and lightly sanded to expose fresh wood and the surface roughened. Freshly roughened surfaces should be immediatly primed with Protectakote Primer. Brush-finished or hand-troweled is best. Ensure that concrete is at least 28 days old and is clean, dry and oil free.